Old car tires are likely to find a new use in making super-dense anode materials for lithium-ion batteries. And offer extended life span for the batteries as compared to the current graphite based batteries. Demand for efficient; high-capacity and longer lasting batteries continues to rise, challenging manufacturers and researchers to come up with better materials and designs. Other electrode options under consideration include the silicon-based cathodes from sand. Already, old tires are known to give an electric car some extra miles per charge, due to their lower-rolling resistance as compared to new tires. Unfortunately, lower-rolling resistance is unsafe, it lessens the car’s grip, cause reduced braking efficiency and longer braking distances. There is also less direct handling as well as an increased risk of a tire blow out, hence not a recommended way to save on battery power. Scientists at Oak Ridge National Laboratory have come up with a better, safe and environmentally friendly way of extending the electric car’s battery life using the old tires without sacrificing the safety. The tires are first shredded, and then pulverized. The resulting compound undergoes a pre-treatment with chemicals to produce a sulfur-rich slurry rubber. This is then filtered and dried to form solid cakes which are put through a pyrolysis process in a nitrogen atmosphere, to produce the carbon black. The carbon black micro-structure makes it a superior material for making the Lithium ion- anodes. It is similar to graphite but has higher energy density due to its porosity and higher surface area which makes it store more electrons per unit mass. 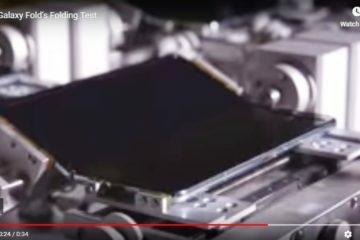 Even though, only prototype laboratory scale batteries have been produced, tests are promising. The carbon black anode battery outperforms the commercially available batteries that uses graphite anodes. After 100 charge/discharge cycles, the battery managed to achieve 390 mA hours per gram energy density. And this makes them ideal for rechargeable batteries, whose demand to sustain more power for long periods continues to grow. The superior performance is encouraging, especially due to the growing battery market for military applications, storage for solar and wind energy, electric vehicles, gadgets and other energy-consuming equipment. Anodes account for 11 to 15 percent of materials in a battery. 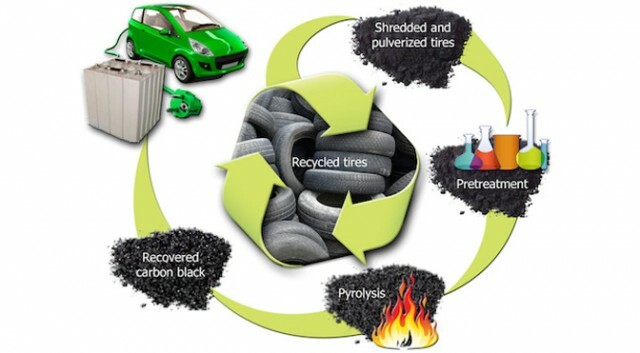 The carbon black from the recycled tires is cheap and hence will lower costs in addition to increasing the range of the electric vehicle battery packs. Other advantages include the carbon materials recovery and reduced environmental hazards arising from waste tires.